I spent the weekend in Atlanta Georgia. While I was there I bought the Atlanta CityPass and visited the World of Coca-Cola. 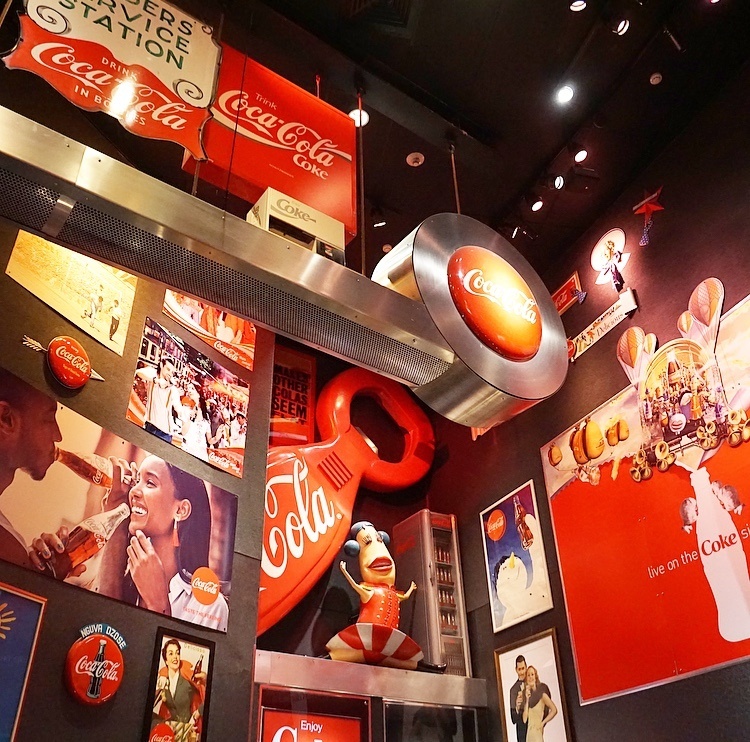 The World of Coca-Cola is a museum that showcases the history of The Coca-Cola Company. While I waited in the lobby for the next guided tour to start, I was offered a sample sized can of Coca-Cola. I tried the Coca-Cola life, it’s a low calorie version of Coca-Cola made with stevia and sugar as sweeteners. To my surprise it was actually really good. The tour began in the loft. The loft had hundreds of Coca-Cola artifacts from over the years. A Coca-Cola employee gave us a brief history of Coca-Cola by pointing to various artifacts and told us what we could expect to see as we continued along the tour. Next, we entered into a small movie theater where we watched a short video that showed moments of happiness. Everyday moments in life where people drink Coca-Cola. After the short video was over, that concluded the guided tour. We were free to roam the rest of the museum at our own pace. As soon as I walked out of the movie theatre I saw the Coca-Cola Polar Bear. 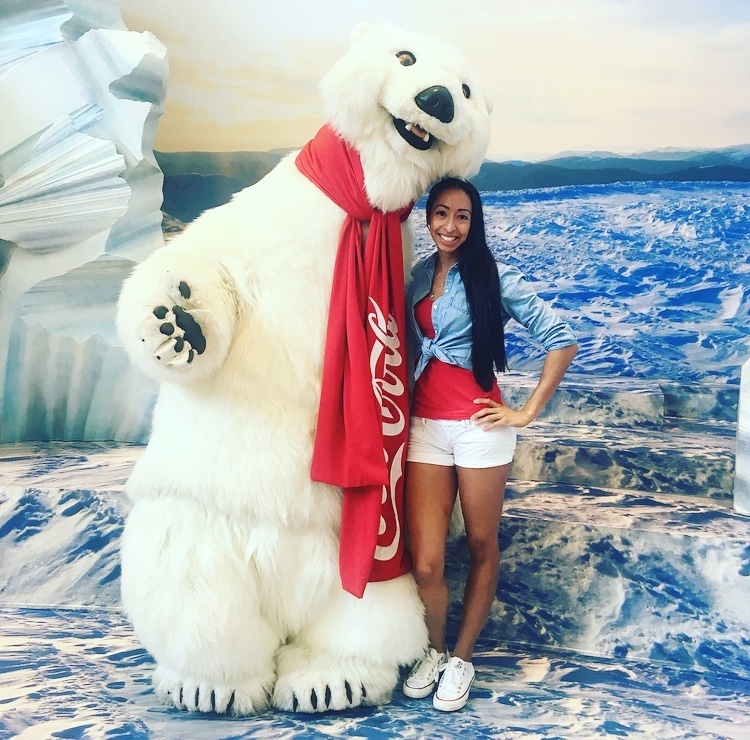 I got to meet and take a photo with the Coca-Cola Polar Bear. 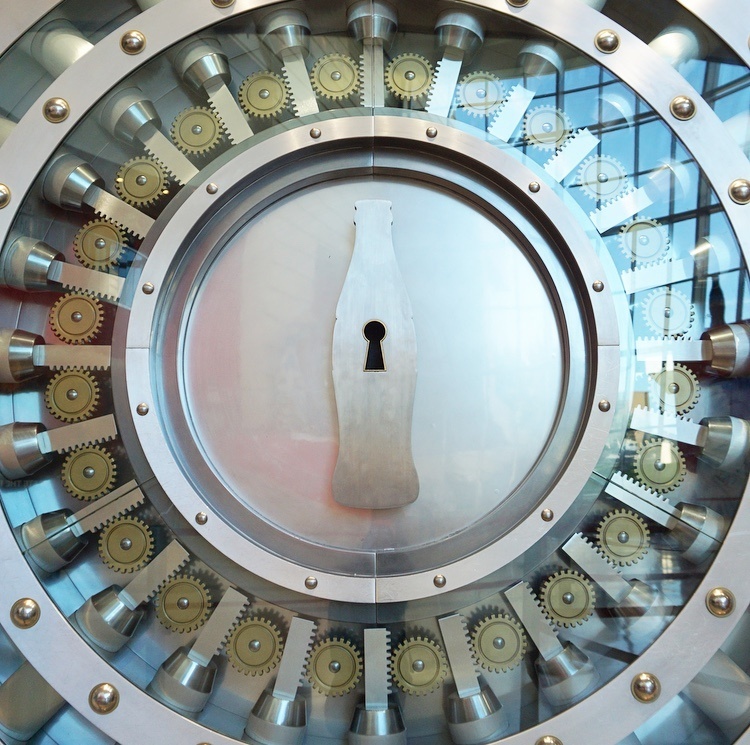 I entered the vault where the legendary secret formula for Coca-Cola is secured. There were a bunch of interactive exhibits that showed how the Coca-Cola formula came to be and the rumors that have surrounded it over the years. For example, one rumor is that only two executives know the formula, and each of them knows only half of it. This was another interactive walk through showcasing the history of the Coca-Cola Company. Towards the end there was a exhibit that had all of the Coca-Cola products displayed. I was surprised to see that I drink quite a few of their products. Most of them being bottled water. There was an area called Bottle Works. This exhibit showed you a behind the scenes look at the bottling process. 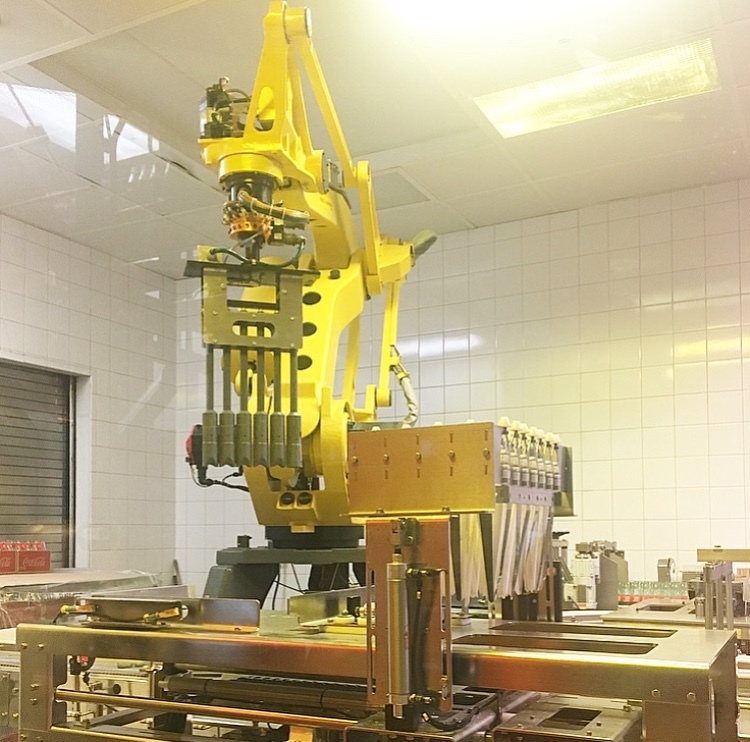 Various equipment were ran bottling lines at a slower pace than those at a plant in order to make it easier to see the bottling process. The Perfect Pauses Theatre was a small movie theater that showed the most popular Coca-Cola commercial advertisements throughout the years and across the globe. I was able to see the 1979 Coca-Cola classic ad with “Mean” Joe Greene. Where a little boy gives football player Joe Greene a bottle of Coca-Cola as he’s walking into the locker room. Joe takes a sip of the coke and then gives his jersey to the little boy as a thank you. The Pop Culture Gallery was an art gallery that showed how fans of Coca-Cola have made the brand an icon of popular culture. In Search of the Secret Formula was a 4-d theater experience where you followed a scientist in search of the secret formula. To be honest I was not impressed by the 4-d experience. The seats were very uncomfortable and moved very fast in a jerking manner. I did not like it at all. I recommend you opt for the seats that are stationary and do not move. They are located towards the back of the theater. Before I left the museum, they had a room called Taste It. Where you could sample Coca-Cola products from around the world. It was a really cool experience getting to see and taste other products that Coca-Cola manufacturers from around the world. I got to taste Coca-Cola from Asia, Latin America, Africa, and Europe. My taste buds were definitely in a frenzy. Some products tasted better than others. The Coca-Cola gift shop had everything you could imagine. From clothes, accessories, home and kitchen decor. I opted for a cute polar bear ornament holding a bottle of Coca-Cola. If you click here you can read about the top three souvenirs I look for when traveling. I vlogged the entire weekend while I was in Atlanta. I’ve linked the video below for you to watch so you can see clips from the World of Coca-Cola.